Today, most media outlets are reporting on the 7 Billion number. This is the most interesting of the reports I have seen. The graphics are very cool. What do you think? Can we continue to grow in population like we are? Leave a comment below and I'll respond. Interestingly, the narrator said, the percentage of population pre 1500 was about how it is today. 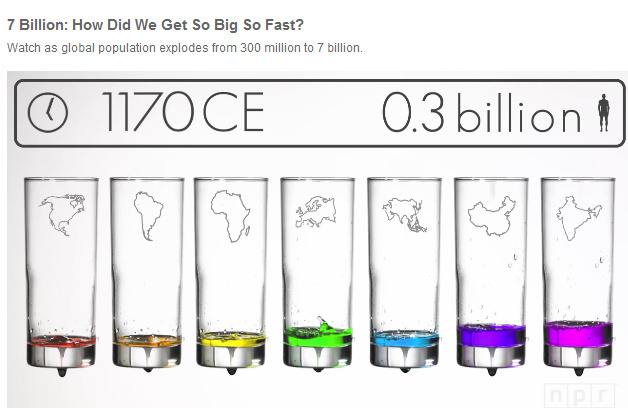 Most people lived in Asia - China and India. But things change after 1500 and the explosion in population is really startling. Now most people live in China and India, but the raw numbers of people is hard to imagine. Hopefully this helped put it into perspective a little.